A few weeks ago I moved jobs, and with lots of people to say goodbye to at my old firm, my final weeks included an impressive number of leaving lunches. One of these was at Taberna Etrusca, just off Bow Churchyard, where my friends and I took advantage of a set lunch menu offering two courses of tasty Italian fare for £17. To start, we were given a choice between minestrone soup, Insalata Caprese (aka buffalo mozzarella and tomato salad), or pan-fried chicken livers with shallots, pancetta and mushrooms. Aside from me, everyone went for the salad, which looked very good: plump slices of mozzarella atop a fan of sliced tomato, all drizzled with concentric rings of tasty vinaigrette. My minestrone soup was slightly less photogenic than the salad, but still tasted pretty good. A thinner, less tomato-based soup than I would usually associate with minestrone, this consisted of a (slightly over-salted) clear broth packed with finely chopped vegetables - a light yet warming start to the meal. For the main course there was fresh tagliatelle with a creamy smoked salmon and baby spinach sauce, pork escalope with asparagus and cream gratin and mashed potato, or pan-fried haddock with a cherry tomato, caper and canellini bean sauce. 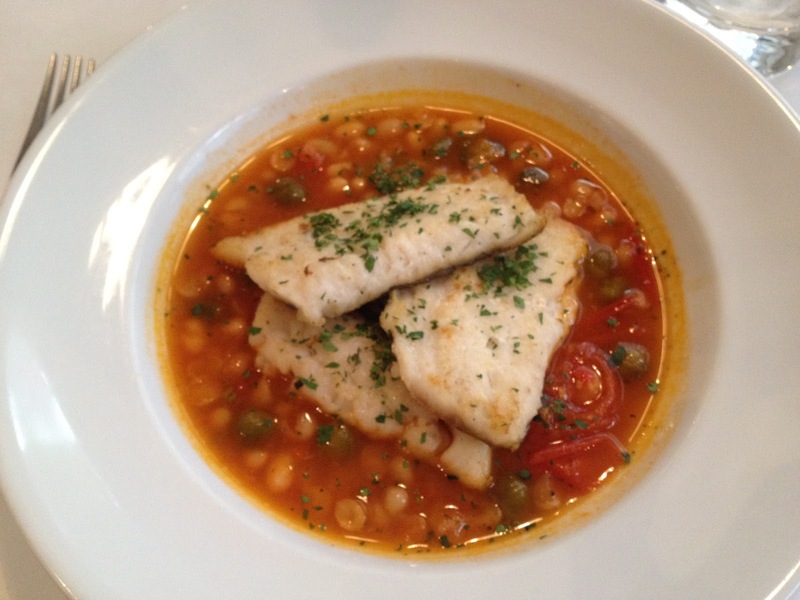 Two of us opted for the fish; three flaky haddock fillets in a pool of tomatoey stew. The sauce was good - crammed with sweet cherry tomatoes, tart capers and tasty canellini beans - but, as with the minestrone, it was slightly too heavily salted for my liking. The two remaining members of our party went for the pork and the salmon options. The pork escalope was highly praised: served with a generous portion of mashed potatoes and drenched in a rich asparagus cream, it did look very good! The smoked salmon and baby spinach tagliatelle also went down well, and is something I may attempt to recreate at home (cook fresh pasta for 2 minutes, drain, stir in cream, smoked salmon, and baby spinach leaves...and you're done!). All in all, it was a lovely lunch, and somewhere I will definitely come again - although I wouldn't recommend it if you're in a rush!